A possible would-be car thief tried to flee from police and got stuck in a storm drain in Canyon Country on Saturday, Feb. 6, 2016. SANTA CLARITA, Calif. -- An alleged would-be car thief who tried to flee from a deputy in California got stuck in a storm drain and was later arrested. An off-duty Ventura County sheriff's deputy found the suspect attempting to steal a vehicle in the 1800 block of Goodvale Road around 5:30 p.m. Saturday, according to the Santa Clarita Sheriff's Department. 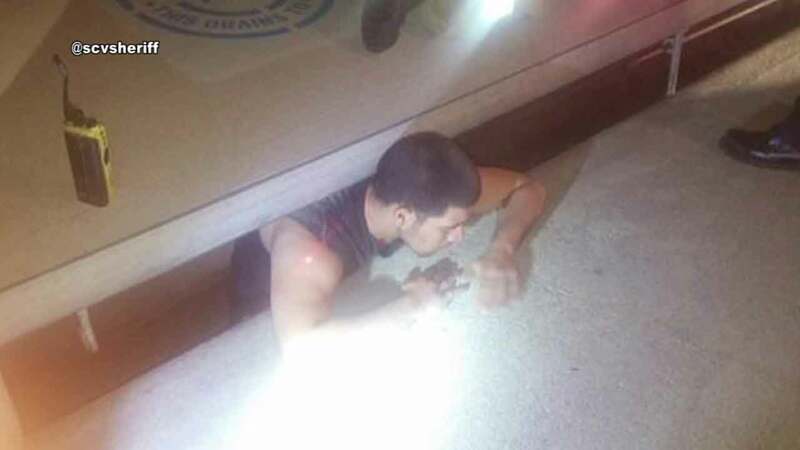 When the suspect tried to flee, the deputy chased after him and found him stuck in a storm drain in the 2700 block of Walnut Springs Avenue. Deputies arrested the suspect from the storm drain and booked him into a nearby station at about 8 p.m., according to the Santa Clarita Sheriff's Department.